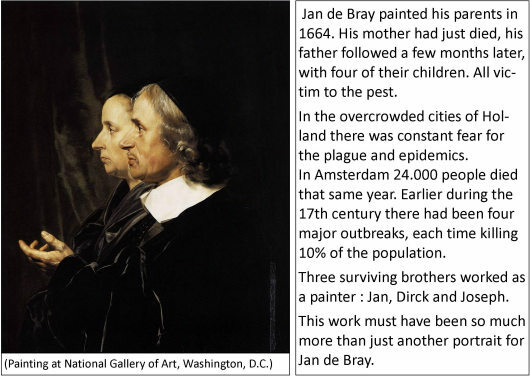 The de Bray : an artistic family. Jan de Bray - success and tragedy. 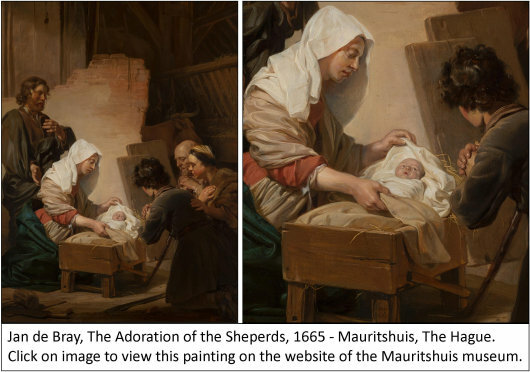 Jan de Bray (c1617-1697), author of the Nativity scene above is not one of those famous Dutch painters of the 17th century. Although he certainly was an excellent craftsman, and highly valued in his time. But like so many, he was not spared by destiny, with disease and death never far away in those days. He was born and grew up in Haarlem, not far from Amsterdam. In an artistic family whose forefathers most likely fled from Hainaut for religious reasons at the early stages of the Eighty Years' War . Hainaut was the most southern province of the late medieval Netherlands. Today it lies partly in Belgium, partly in France. Father Salomon de Bray was a many-sided artist. Painter, poet and architect. He played an important role in many Haarlem cultural projects and organisations, and as a town planner. He married Anna Westerbaen, sister of the painter Jan Westerbaen. 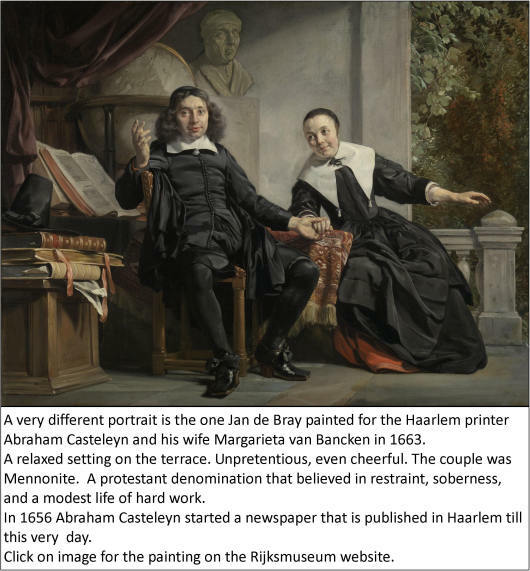 For a couple of decades Jan de Bray was the leading portrait artist of Haarlem. 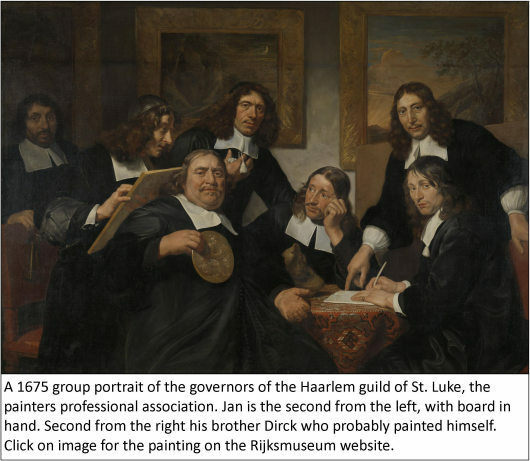 Certainly after Frans Hals had grown old, and died in 1666. Both father Salomon and son Jan were very successful with their portraits. Sometimes stately, sometimes very lively. Probably also depended on what their patrons wanted. We must keep in mind that a 17th century painter was first of all considered a craftsman, more than an artist. Painting was business. In any case, their work shows great love for the meticulous detail. 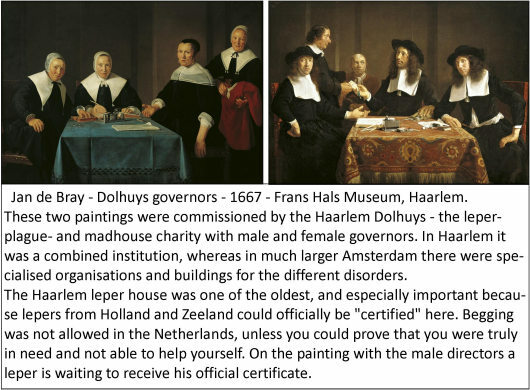 Jan de Bray encountered a lot of misfortune in his personal life. He married three times, but marriage ended with the wife dying within two years, at least once in childbirth. Several of his children died too. Every time he lost a wife there were disputes about the inheritance. Of course very unpleasant, but also costly affairs that got him into financial trouble. When he was over sixty years old, Jan apparently started to devote more time to architecture and other projects. He moved to Amsterdam where he worked on plans for a better freshwater supply. Indeed a matter of vital importance for the city. Contrary to his father, Jan was clearly financially not too successful in these matters. He got deep into debt, and was declared bankrupt in 1689. His three houses and all his paintings were auctioned.